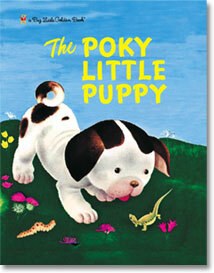 The Poky Little Puppy - Golden Books - Give it to a Child you Love! You will receive The "New Stuff" Newsletter from The Personalized Kids Store. We hope you'll enjoy The Personalized Kids Store Newsletter. Add a photo, create a dedication, and we'll do the rest. You'll create a unique gift – A Personalized Children's Classic – they'll treasure forever. One of the original 12 Little Golden Books, The Poky Little Puppy has sold nearly 15 million copies since 1942, making it one of the most popular children's books of all time. Now this curious little puppy is ready to win the hearts and minds of a new generation of kids.